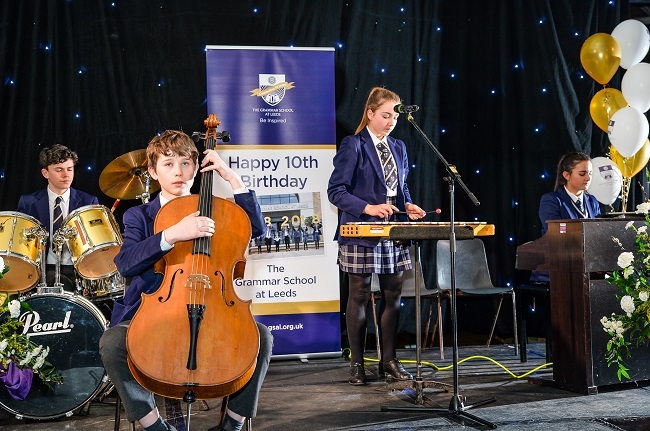 Nostalgia, The Future and Coming Together are three aptly named original pieces of music composed by pupils to celebrate the 10th birthday of The Grammar School at Leeds (GSAL). GSAL came into being in 2008 through the merger of Leeds Grammar School and Leeds Girls’ High School, and a year of 10th birthday celebrations kicked off this week. A launch reception was held at the school on Thursday 22 February, during which the 240 guests enjoyed performances by Year 9 students of their own original music, composed specially to mark the birthday. The young musicians had created their ensemble pieces during a workshop day with pianist, composer and music educator Andrew Quartermain, who is CEO and artistic director of Pro Corda, a music and education charity. Andrew said: “The day is like the musical version of Ready Steady Cook – you’ll take the raw ingredients and produce a fantastic dish in a short space of time. Throughout the year GSAL students will be working on a number of birthday themed creative projects, including a sculpture by a sixth form student and the production of handmade poppies to be installed in the school grounds in November to commemorate former students who lost their lives in the two World Wars. The school has an exciting programme of activities planned for the 10th birthday year, including alumni events in Leeds and London and a weekend of celebrations in the school grounds in July for students, staff, alumni, parents and friends. The school has even commissioned a special birthday beer brewed by Leeds Grammar School old boy Richard Shelton of Ilkley Brewery. The inaugural Leeds Luminaries Awards will mark the outstanding achievements of alumni; and the school’s birthday bursary campaign aims to fund an additional 10 places for students starting in September – one new bursary for every year of GSAL.